What is total skin rejuvenation? Total facial rejuvenation is a phrase that describes a cosmetic treatment that addresses all aspects of the aging process. This results in a more complete skin rejuvenation plan. Facial volume loss – It is one of the first signs of ageing; facial volume loss occurs in the cheeks, around the eyes, brows, lips, around the mouth, chin, nasolabial folds and laugh lines, giving the skin a tired look. Dermal fillers are used to replace the volume that has naturally been lost over time. They enhance and balance particular areas of the face, like, making the chin more prominent and better aligned with the rest of the face. This process of replacing facial volume for rejuvenation or enhancement is often termed as "non surgical facial shaping". Dermal fillers can be used to lift the face and skin through strategic placement in the face. They also help smoothen the transition from one facial area to another so as to give the face a more aesthetic and even appeal. For example, by filling the under eye hollows (or tear troughs), the transition from the lower eyelid to the cheek is streamlined. This process results in a more refreshed appearance and hides the effect of gravity on the skin. Radiofrequency (RF) – is a non-invasive, no downtime treatment, that is used for skin tightening. It uses radiofrequency energy to heat the skin to a temperature between 39 and 42 degrees celsius. This helps to shrink skin collagen and remodel the skin, resulting in skin tightening. 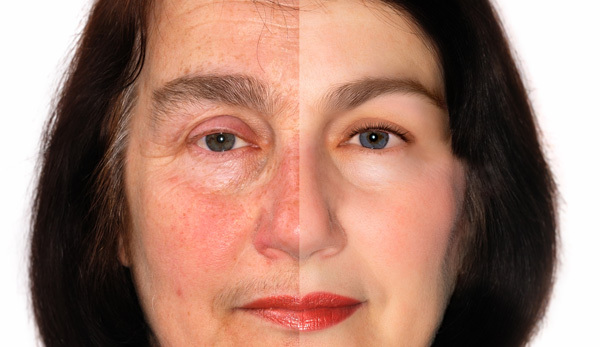 Expression lines – These are another part of the ageing process that can be addressed non-surgically. They are wrinkles and lines that get indented and appear even at rest. They result from the contraction of muscles while making facial expressions. With time, these can cause etching of lines in the skin, such as frown lines or crow's feet. These are simply addressed with Botox injections that relax select muscles and maintain a natural look. Surface wrinkles – These are etched in on the skin, i.e. present even at rest, and are best treated with skin resurfacing. This can be achieved by the RF pixel or deep chemical peel. The radiofrequency actually ablate (vapourise) a very fine layer of the skin surface, allowing the skin to regenerate with fewer wrinkles. There is usually a week or two of recovery time, depending on the intensity of the treatment. The RF pixel also improves brown spots and general skin texture/tone and is safe on Asian skin. Skin wrinkles can also be treated with less invasive methods, such as medical grade skincare (including topical retinoid). As a rule, the more invasive a treatment, the greater the downtime, and better the results. Why Skin & You Clinic for total facial rejuvenation? The doctors at Skin & You Clinic, Mumbai, specialize in non-surgical total facial rejuvenation. We understand that by addressing all areas of concerns like pigmentation, lines and wrinkles, lax skin and facial volume loss, we can restore the complete fountain of youth to the face. In consultation with the patient, depending on his/her expectations, concerns and required downtime, we formulate realistic goals to achieve the best possible result.